FC Qarabag 0-4 Chelsea: A professional performance earns praise from the boss. 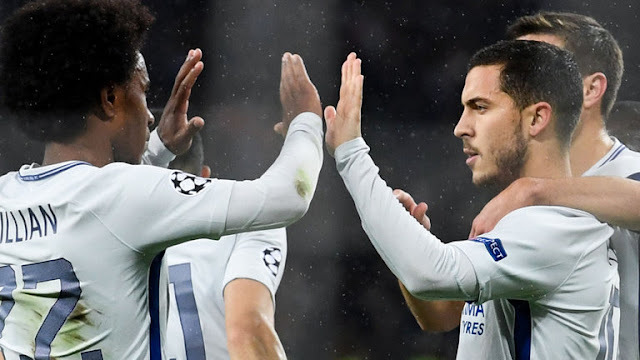 Chelsea sealed their progress into the last 16 of the Champions League with a emphatic 4-0 win over FC Qarabag with goals from Eden Hazard, Willian (2) and Cesc Fabregas. Antonio Conte mindful of a big game at Anfield coming up on Saturday evening made the decision to make four changes to his starting eleven and a chance to our formation heading into the game. Moving to a 3-4-3 formation, in came David Luiz, Antonio Rudiger, Willian and Pedro for Gary Cahill, Andreas Christensen, Tiemoue Bakayoko and Alvaro Morata. 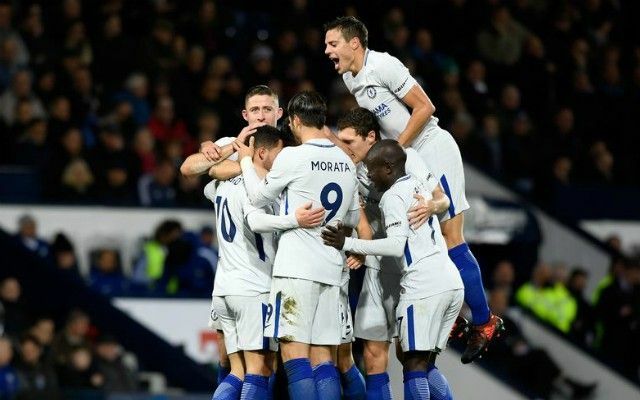 In what on paper appeared to be a difficult trip to Azerbaijan to face FC Qarabag yesterday afternoon, Chelsea eased through the game helped by a decision that turned the game in the 20th minute. Up to that point, and we have to be honest here, our hosts made a good start to the game as Chelsea looked to come to terms with the changes to the team and formation. If anything, they should have been 1-0 up in 15 minutes as some good interplay found Michel unmarked making a run into the box and his shot smacked against the crossbar and deflected away from danger. It was after that point that Chelsea found their feet, turned the screw and began to put some good passing moves together. On 20 minutes, Hazard playing as the false number nine, dropped deep, spotted the run of Willian into the box and played him in. 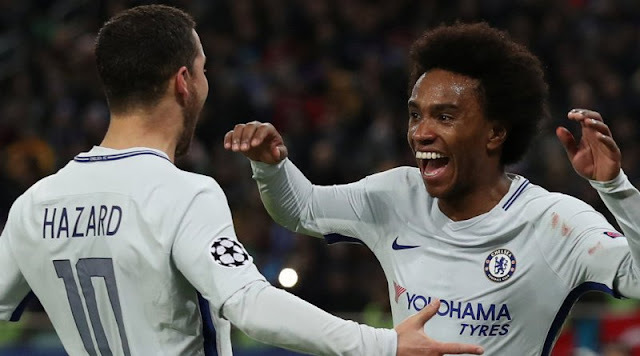 Just as he looked like getting in front of the defender, his opponent the Qarabag Captain grabbed his arm, Willian went down and the Referee awarded Chelsea with a penalty sending off the unlucky defender for denying the Brazilian a goal scoring opportunity. Looking at the incident, the penalty award was enough and their skipper was unlucky to see red but as you will all know, decisions like these even out over the course of a season. Eden Hazard stepped up and struck the ball home into the bottom right corner to make it 0-1. Now Chelsea were in total control and popping the ball about with freedom. Cesc Fabregas once again in the middle of midfield looking to orchestrate always looking for that killer pass or ball over the top to unlock the door. With Eden Hazard, Willian and Pedro always moving and looking for the ball, it became a training game for the Blues and our pressure told later on in the half. Fabregas spots Pedro who has come inside off the left hand side and flicks the ball up to him, with a deft first-time touch, he knocks it down to Willian who controls with one touch, flicks the ball up to Eden Hazard who has made a run across the edge of the penalty box, Hazard takes a touch to control the ball and then back-heels the ball back into the path of Willian who has made a run off of the defender into the box and he slots the ball home passed the goalkeeper who is helpless to make it 0-2 and game over. It was an outstanding piece of football and a demonstration of exactly what that quartet in attack are capable of. Half time 0-2. The second half became a non-event if anything with the hosts being down to ten-men and two goals down. It became a real training exercise for the Antonio Conte's men with the emphasis being on how many more goals we could score. Chelsea created plenty, scored two but should have had many more if we are honest. 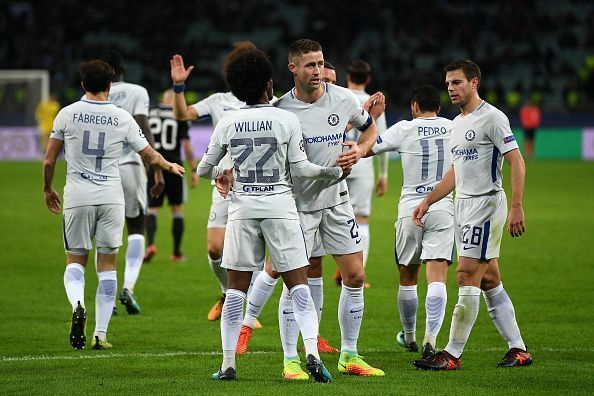 Chelsea were awarded their second penalty of the night after Willian had his shirt pulled in the box as he looked to drift passed a defender. With Hazard being replaced for Alvaro Morata on the hour, Cesc Fabregas stepped up and rifled the ball home to make it 0-3. Willian wrapped up the scoring late on with an unstoppable shot from outside the box to make it 0-4 and two goals for him on the night. It was such a professional performance from the Blues and exactly what we needed to qualify for next round. If anything the only complaint we can have is that we didn't score more as Alvaro Morata was denied twice from close range and a good save from the goalkeeper to deny the impressive Cesc Fabregas. The added bonus on the night was Atletico beating Roma at home 2-0 meaning that Chelsea take control of the group and sit top on ten points with Roma behind us on eight. Atletico need to beat us at the Bridge to have any chance of qualifying but with Roma facing Qarabag at home, it looks like the Europa league for them. Chelsea need to beat Diego Simeone's side to ensure we top the group. "This group is showing great character. From the start we faced a lot of problems this season. Our answer was positive, almost always positive. For sure, the second half against Roma was bad. These players show me every day great commitment, great will, desire to fight. We are a really good squad. There is a great compactness between us. I think it will be very important for the present and the future." - Source Daily Mail. An excellent performance all-round. Onwards and upwards!